Joharo at home: Time for reflection.. This last week and the one to come will be a time of looking back and reflection for me as my son, Josh, heads off to university. Where did the last 20 years go? The small boy who used to hold my hand, say 'hittaponatus' instead of 'hippopotamus', play endless lego, snuggle up for cuddles at bedtime story telling, eat like there's no tomorrow.. is all grown up, passed his driving test yesterday and is about to embark out into the big wide world on his own, a long way from home. I am feeling very nostalgic, sad but happy, anxious but also excited for him. I covered a large notebook firstly with wadding and then some fabric that I had left over from making my bedroom curtains..
.... and then I put in pictures of things that inspire me, colours that grab me etc... and fill the page with my thoughts, ideas and lists!!!. I guess it was the strawberries that I liked here!! I love the autumn colours on this page... the reds, oranges and browns... so warm and rich... It makes me look forward to stomping through leaves, jumping in muddy puddles and coming home cold and wet but knowing there's hot chocolate and hot buttered toast on the way! I'll keep you posted on the packing and preparations. Maybe this post might inspire you to start your own journal.. I do hope so, let me know if it does, I'd love to hear about it. 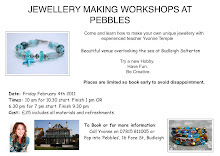 Am off now to prepare for my trip to Sidmouth tomorrow to talk about the jewellery workshops that I mentioned on the last post... wish me luck! I think your journal is lovely - I started my blog as a sort of journal, but yours is much nicer! I have a son off to university in a couple of weeks - I feel that it has all passed in a twinkling of an eye - quite a difficult time emotionally for mothers, I think. Yes where do the years go? I have three boys 28, 27 and 23 It only seems five minutes ago when my eldest first started nursery and came home wanting to write his name everywhere, when my middle son wanted to be in his school play and my youngest son was lining up his Thomas the Tank Engines around the edge of the carpet. He now has a daughter of his own. Oh your son will thank you for revealing those little snippets to the world!! Don't you just love mothers I feel it's their job to embarass their offspring!! Go, go, Jo!! You sure have encouraged me to do one, also! I suppose, that we just have to H.O.P.E FOR THE BETTER! C.O.N.G.R.A.T.U.L.A.T.I.O.N.S for your son for passing his driving test and for going to Uni! What a great achievement! You must be a very proud mummy! A lovely journal. I've been thinking about doing one, but not got round to it. I think you have inspired me to get cracking! I hope your son settles into Uni well. It is such a difficult time isn't it? So scary how quickly they grow up! Been in a similar position son leaving home but was to join the Army last March and his pass out parade in on Friday then 2 wks off and then the worrying begins!! Agree where has the baby gone? What a beautiful book and a lovely idea. I still have all of that to come with my son, but it's probably not long now and the older he gets the more I want things to slow down.